Lots of apps in your Android smart phone?? And passwords set for most of them! With the growing need of people to have paramount security in their life, they set up passwords for most of their apps as well as online social media, shopping and banking sites. So the problem arises when you have a whole lot sets of passwords and, you keep forgetting them as they are too many to remember. Also keeping a single password for all they will make you vulnerable to all kinds of security leaks. So what you do in such situation is that you download a password manager app which functions in a way such that it keeps a store of all your various passwords, personal details and, login names in the form of encrypted data in a vault which can be easily accessed by you anytime you want. This app stands out in the category of Password Manager Apps as it offers endlessly excellent features. It has both free versions which is, of course, free of cost and is supported only in desktops and browsers, as well as the premium version which is the app for the mobiles which costs $12. It functions in a very simple manner. All you Need to do is just set a master password for opening this app itself, and inside this one app, all the password and login details of all other apps will be present. Also, every time you log in to some website, your details will be saved automatically. These details will be auto-filled in those sites whenever you log in next time. Also, using the secure notes feature you can save your important details like credit card numbers, PIN's, etc. It supports Firefox, Internet Explorer, Chrome, etc. extensions. This app is one of the highest rated Android apps which is developed by Dashlane. The functioning of this app is easy; all you have to do is just tap once to log into sites or enter your credit card details. Dashlane uses AES-256 encryption to protect the data. The only person who will be having access to your information will be you, as there won't be ever any record of your Dashlane Password. Your apps will be auto-locked after your phone becomes inactive for some specified time. You can even choose where to store your data. To make your online payments in a secure manner, you can use the digital wallet of Dashlane. If anyone tries to breach your security by entering the wrong password, then you get alerts. Developed by Keeper Security Inc, this app is one of the leading password manager apps. It uses ultra-powerful AES-256 and PBKDF2 encryption to store your documents, passwords, photos in a safe manner. The very first time you log in to some website, your login details are saved and gets auto-filled whenever you go to that site again. The self-destructs option is helpful in instances when your phone gets stolen, as this feature erases all the data present in your phone before anyone else can hack into your details. The encrypted safe keeps your private photos, files, and videos safe from any prying eyes. It even has a private cloud vault, in which your data would remain purely secured. To make the whole process of security all interesting, it even has unique background themes. Developed by Croco apps, this app comes for free in the Google Play store. This app is currently emerging as one of the most advanced apps in this section. The user interface is based on Keepassdriod which makes its functioning so error free. Using this app, you can read and write .kdbx files. It can even integrate with most any Android browser. The browser integration feature is activated when you select the Keepass2Android and displays all the entries for current visited URL's so that you can copy paste the login credentials of the recently visited sites. Other than having to enter the strong, complicated password every time, using the unlock feature you just need to enter the complex password just once and then just enable QuickUnlock. When you enable QuickUnlock then after a certain period of idle time, the app will auto-lock itself. And whenever you wish to open that app again, you just need to type the last three characters of your long, complicated password. Isn't that just simple enough! Developed by mSeven software LLC, this software can work on Windows, Mac, Android, iOS platform. The auto-login functionality does auto-filled your credentials into the sites and apps every time you have to log in after you enter your details for the first time in the respective sites. The upgraded user interface gives the app a more modern touch. The alpha-scroller feature lets you jump from one section to another swiftly enough by just one tap. And in case if you ever need some information which you deleted from your phone back in time, then you can easily recover them as this app comes with record recovery choice. With the help of password generator option you are sure can have un-guessable passwords which will keep all your sensitive information safe and secure. And also, the optional self-destruct option is always there to be used if you ever feel the need of it. Developed by Lunabee Pte Ltd, although this app doesn't come for free, it is sure to provide you with features which will make it worth your paid money. This app stores all your credentials, important information etc. in a very secure and safe manner. With the ready made templates, it becomes easy and quick for the users to enter their details. For those type of details and information which you feel need extra security, you can use the double-protection category. The AES-256 encryption ensures a perfect protection against all malicious cyber attacks. The e-mail and device backup holds on to your information so that you never have to worry about losing those details. The cost of this super-safe password manager app is Rs.306.92. Developed by Abine Inc, this app comes with a 30-days free trial pack after which you have to pay $79 for three years time. As this app is concerned about the real security of your information, so they mask all your details like login credentials, credit card numbers, e-mails, phone numbers, etc. Using the AES-256 encryption, it is sure that none of your information gets leaked out. The auto-fill options save you the trouble of having to enter your login details over and over again in various sites by auto-filling the details in online forms. It even has a private browser using which you can surf the web without being tracked by different companies. The encryption keys are stored with the help of host-proof hosting while the encrypted data is stored in DropBox. Developed by Sober Systems Inc, this app comes for free of cost in Google Play store. What makes this app remarkable are the features like user-friendly interface, seamless Integration, and top-of-the-line security system. Using the "Matching Login" feature, it becomes easy to handle multi-step logins. Like most of the other apps of this category, Roboform too saves the login details whenever you log in to a website for the first time so as to save you the effort of entering the details again and again by auto-filling them. The built-in password generator helps to create a strong and unique password. The auto-sync option helps synchronize the data from your Roboform with multiple computers and mobile devices. With a rating of 4.4, the app has come to be one of the most popular password manager apps on Google Play store. Developed by Synpet, this app comes for free of cost. Along with keeping your passwords, credit card information, web accounts, etc. secure it also has a built-in editor that allows you to change or create new data categories. 4. 15 Shortcuts For Android I'm Using Right Now You can also backup and restore the encrypted data file to the Android USB device. After a particular number of unsuccessful attempts have been made to crack the password, the auto-destruction option destructs all the details. Also, the auto-lock option too can be set to function after some pre-determined amount of time so as to lock your phone during idle times. This lightweight Android app, developed by AgileBits is compatible with Android 4.1 or higher version. This free of cost application is very easy to use and does provide us assurance of keeping all our passwords safe under the guidance of Master Password. In Marshmallow devices, you get the option of fingerprint unlocks. The secure password generator lets you create a unique, complicated password which tightens up your security. Auto-lock option makes sure that your vault is locked and your data is Safe in the case of some theft. This app saves all your login details and fills them on websites and in third-party apps with just a few taps. 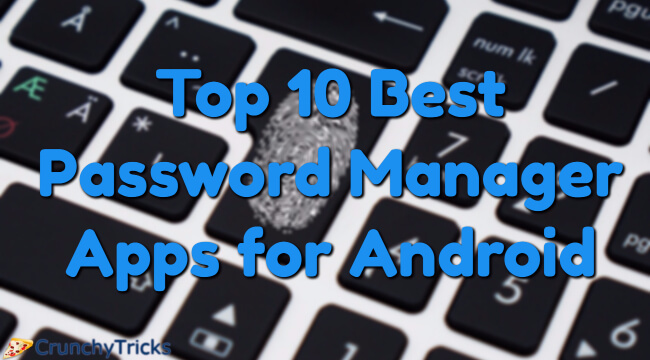 This is the list of the all the password manager apps that will help in managing your security online as well as keeping all the passwords and apps safe.